This cute bear in a costume is from the Create a Critter 2 Cricut cartridge. This cartridge is one of my favorites-there are so many great images! The twine is Maya Arts, the word stickers are Tim Holtz, and the papers on the background and behind the bear are from DCWV. Thanks for stopping by, and I hope we see your card! Sooooooooooo cute!! LOVING that bear!!!!!!! uuiii too cuuutee I love the teddy and his costume cute cute cute Katy...and that DP is great for halloween card..lovely Halloween card teammy...see you on my DT post dear..hugs, Monika at Cute and Fun team HOC.. He is just adorable all dressed up and ready for trick or treating! I like the wrapped twine around the spine too. Great card. Definitely cute and FUN, teamie! Cute card! 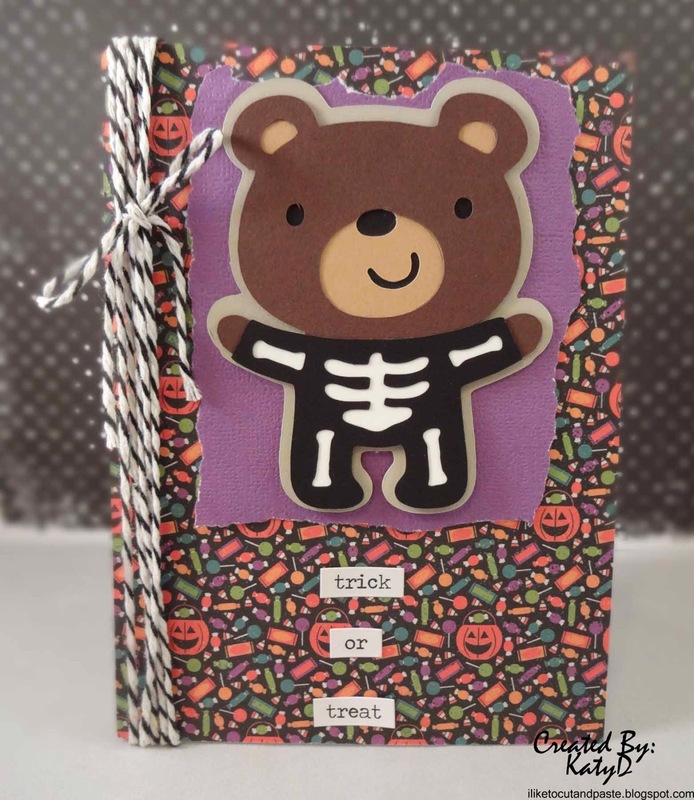 Love the die cut bear's skeleton costume! This is adorable Katy! I love that little bear and his costume!! this is so totally cute.. love that little bear..
Sweet little Teddy Bear in his skeleton costume! Have a great day. OMG, the bear is sickeningly cute!!! I have the Critter 1 cartridge and perhaps should buy this one too! Oh this is just so cute - love is Hallowe'en costume!